Spatial Timber Assemblies is a joint collaboration of Gramazio Kohler Research, ETH Zurich and ERNE AG Holzbau. The focus is on the development and implementation of an innovative robot-based fabrication process for timber frame modules. 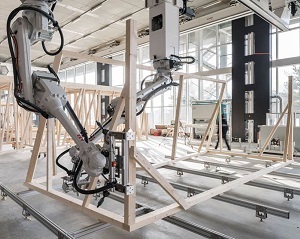 This process builds upon existing methods of timber framing by adding the robot’s ability to produce parts just-in-time and to precisely place material in space. The implementation of the robot allows the timber modules to be highly prefabricated regardless of complexity, thus enabling quick and simple on-site assembly. A computational design model has been developed which generates timber beam geometry based on multiple input parameters. The main design inputs are walls represented as single surfaces and points indicating where connections to exterior systems can be made – such as to the Smart Slab concrete slab in the case of DFAB HOUSE. The resulting beams are then dimensioned based on the predicted loads, and checked against fabrication and assembly constraints.